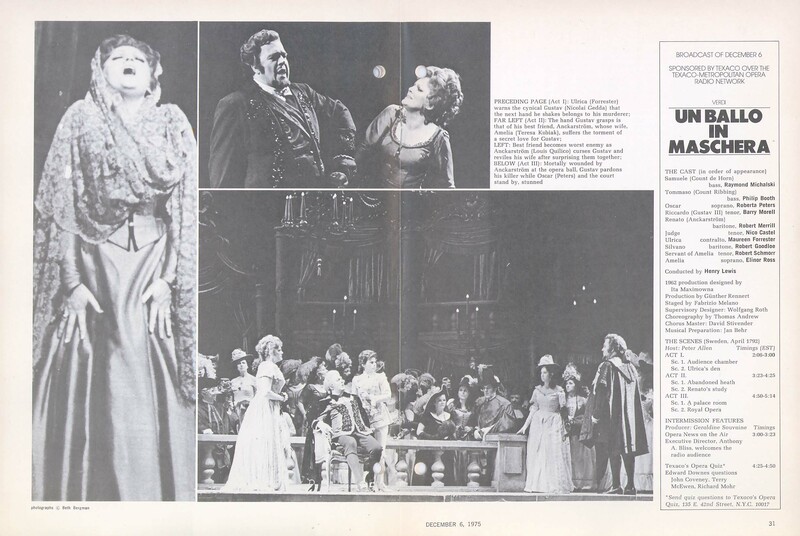 UN BALLO IN MASCHERA:Verdi Original Air Date: 12/06/1975 Lewis; Morell, Ross, Merrill, Peters, Forrester SID.19170318 Merrill who had a virtual lock on Renato for two decades (one broadcast to Milnes) is still in decent form … Continue reading "UN BALLO IN MASCHERA"
IDOMENEO:Mozart Original Air Date: 01/15/1983 Levine; Lewis, Valente, Behrens, von Stade, Alexander SID.19170319 This is the first of two Valente Ilia broadcasts, and she is excellent. 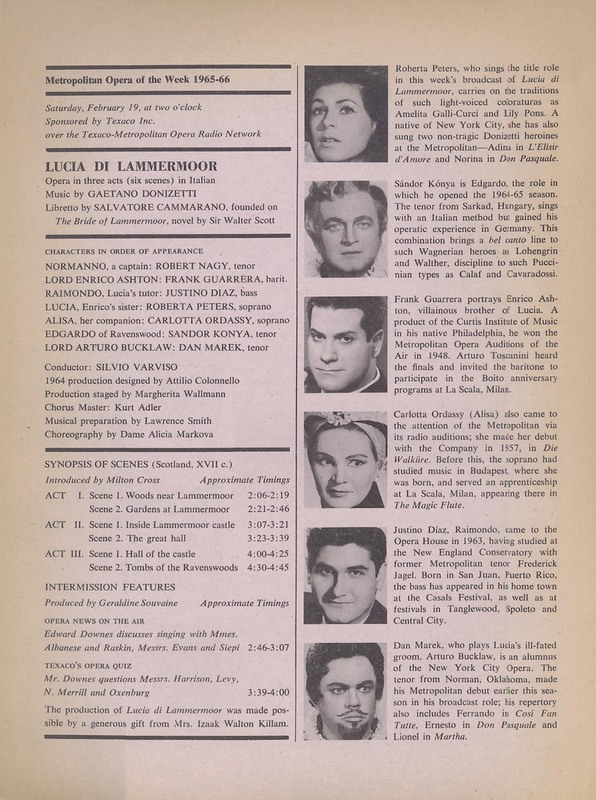 Behrens’ Elettra is not to my taste. 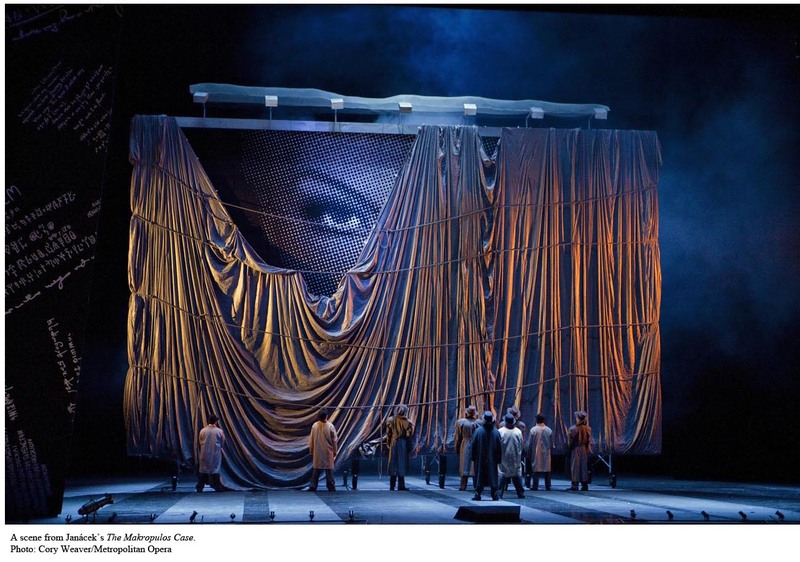 Both Vaness … Continue reading "IDOMENEO"
LUISA MILLER:Verdi Original Air Date: 03/02/1991 Santi; Esperian, Pavarotti, Nucci, Plishka, Koptchak, White SID.19170320 Luisa Miller has done well on the air, although not entering the broadcast repertory of the Met until 1968. 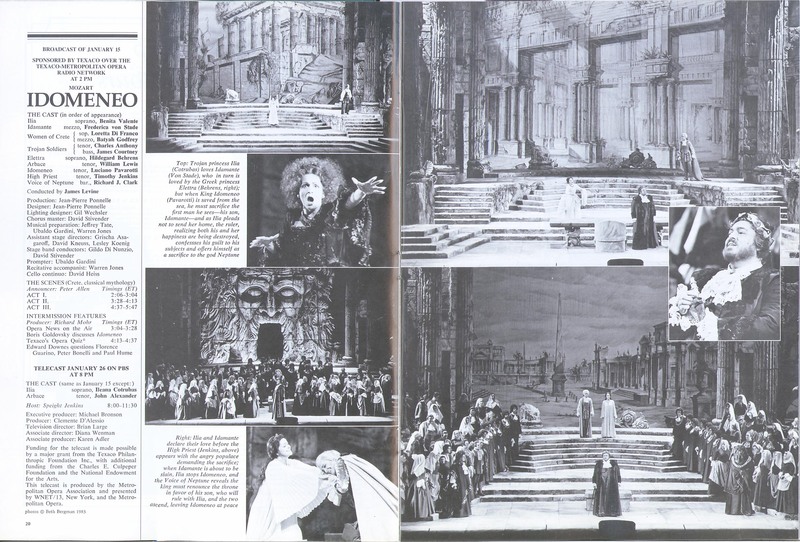 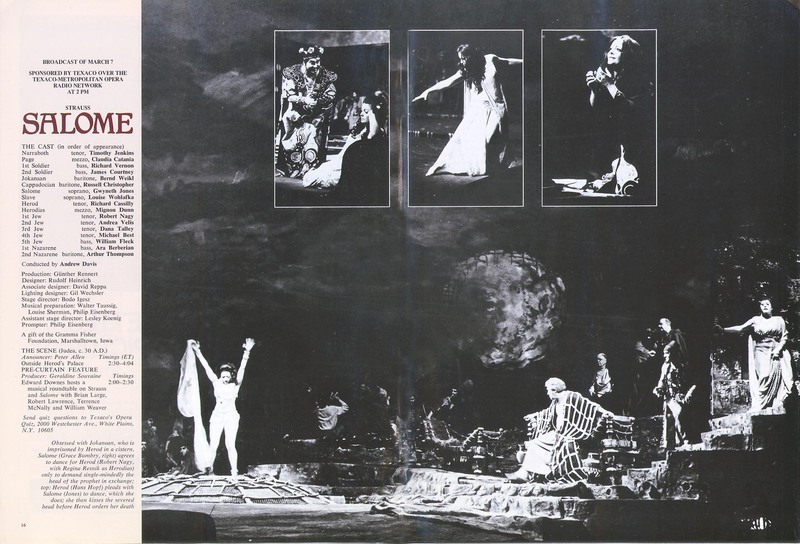 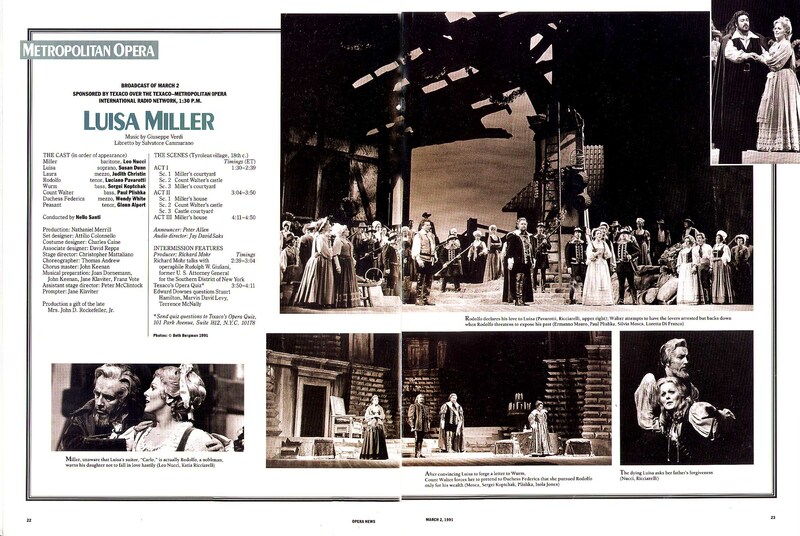 The title … Continue reading "LUISA MILLER"
SALOME:Strauss Original Air Date: 03/07/1981 Davis; Jones, Cassilly, Dunn, Weikl, Jenkins SID.19170321 This is Jones’ only Met broadcast as the Judaean princess. 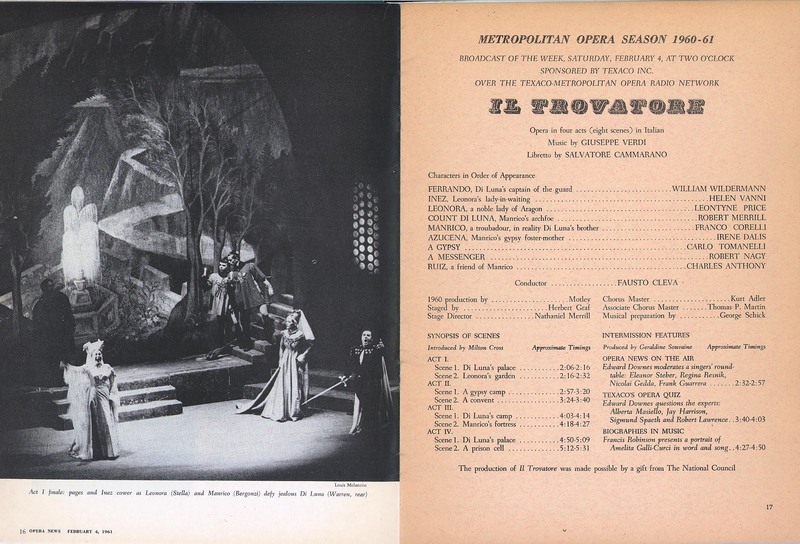 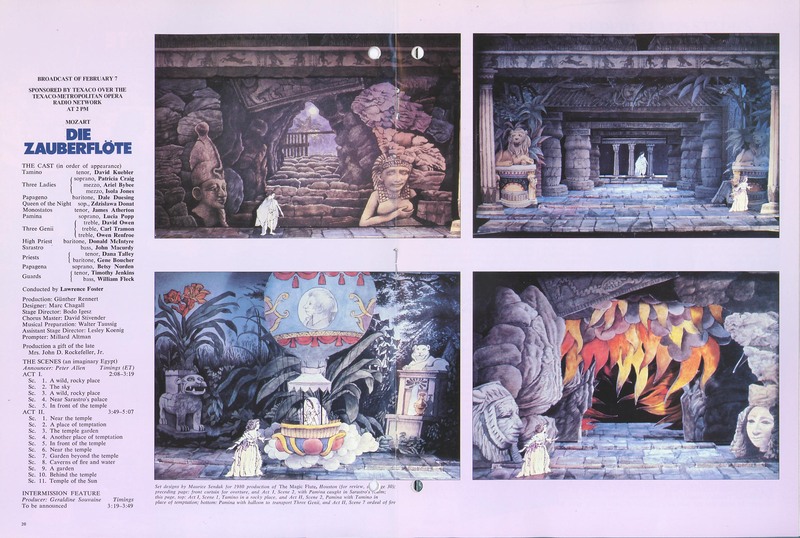 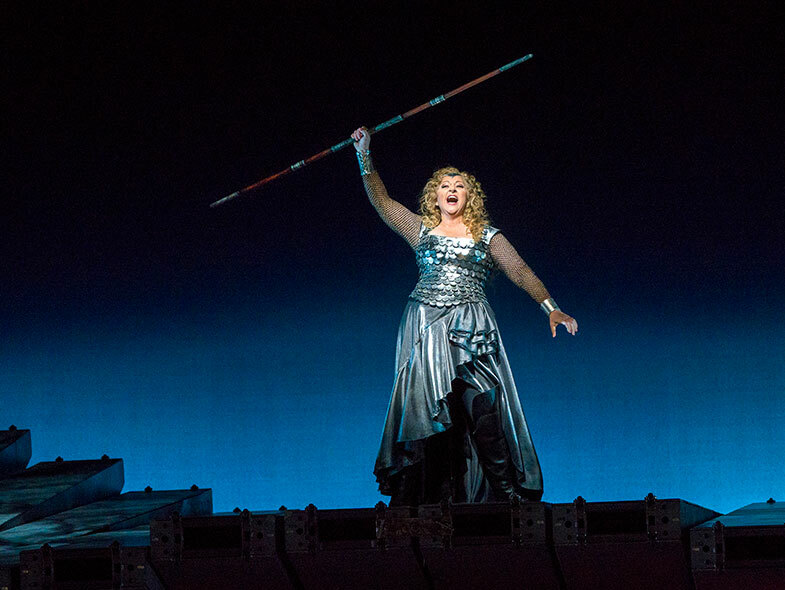 Her singing in this period could be variable, and in the house, she … Continue reading "SALOME"
THE MAKROPULOS CASE:Janácek Original Air Date: 04/18/1998 Mackerras; Malfitano, Brubaker, Fox, West SID.19170422 This is Malfitano’s only broadcast of Emilia Marty, and this run was the first time at the Met in Czech (Norman premiered … Continue reading "THE MAKROPULOS CASE"
LUCIA DI LAMMERMOOR:Donizetti Original Air Date: 02/19/1966 Varviso; Peters, Kónya, Guarrera, Díaz SID.19170423 It’s a change from the Sutherland 1966 performance 10 months later, but Konya is not my idea of Edgardo, and I prefer … Continue reading "LUCIA DI LAMMERMOOR"
DIE ZAUBERFLÖTE:Mozart Original Air Date: 02/07/1981 Foster; Popp, Kuebler, Duesing, Donat, Macurdy MOD Audio SID.19170424 Lucia Popp made her debut with the Chagall Flute as Queen of the Night, the first season in the new … Continue reading "DIE ZAUBERFLÖTE"
CAVALLERIA RUSTICANA / PAGLIACCI:Mascagni / Leoncavallo Original Air Date: 02/04/1995 Badea; Guleghina, Jóhannsson, Pola / Dessì, Martinucci, Nucci SID.19170425 Another Cavalleria of minimal interest– there must be something better in the archives. 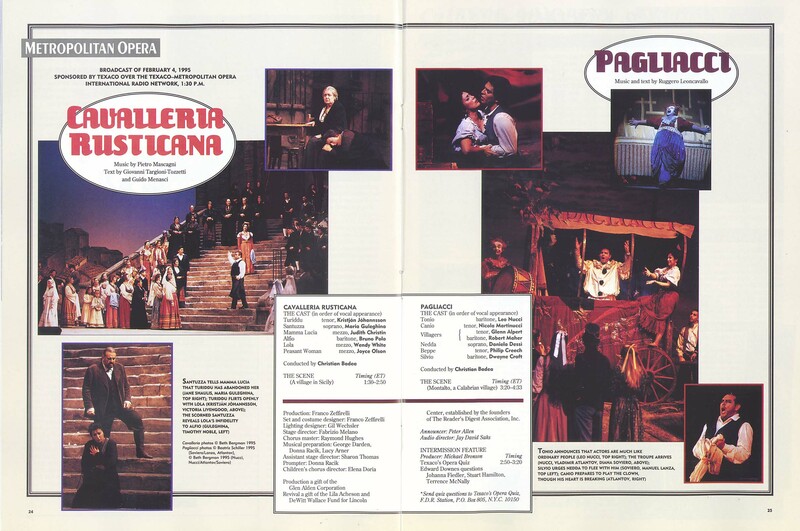 The Pagliacci does … Continue reading "CAVALLERIA RUSTICANA / PAGLIACCI"